This is a great culminating project to use with students to analyze characters and plot events either in a silent reading book and/ or a novel being read in class. 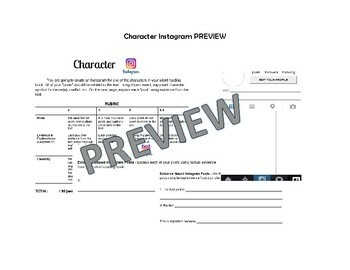 Students choose a character from their novel and create an Instagram for them; their posts include important character traits and significant events from the text. Students are also required to explain each post using evidence from the text. Included in this resource is an editable assignment sheet for students that includes instructions, assignment rubric and explanation sheet; PDF Instagram template; and an editable modified explanation sheet for students who may need further support with their evidence. RL 1: Cite several pieces of textual evidence to support analysis of what the text says explicitly as well as inferences drawn from the text. RL 3: Analyze how particular elements of a story or drama interact (e.g., how setting shapes the characters or plot). This assignment could also be modified to analyze a historical figure or event. After purchasing/ using this product, PLEASE rate it and/or leave feedback! It is much appreciated!